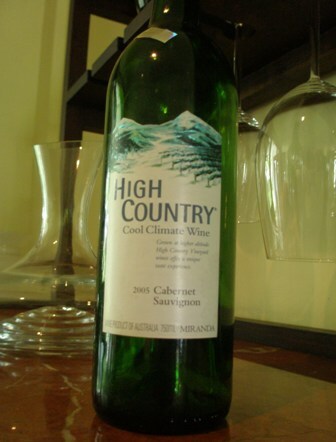 “High Country – Cool Climate Wine” is what the label on the bottle said and that is why I bought it in my local duty free shop during my monthly ration collection. Our own wine producing region, the Upper Goulburn Wine Region (www.uppergoulburnwine.org.au) used to call itself “High Country” for a while, before settling a couple of years ago for the new name and regional denomination. The wine came from Miranda (or today Sam Miranda), a 2005 Cabernet Sauvignon, and retailed for US$ 15.30 here in Jakarta. The price suggested “a wine for every day”, nothing special but enjoyable. And enjoyable it was. In fact I loved the mid-palate weight, the structure, the aroma of dark fruit and the long and strong finish. As always while writing blog entries I was enticed to do some more searching on the net and to find out more about the circumstances of the wine and/or the winery where it came from. Last year I visited the King Valley for the first time. It’s a spectacular entry if you come from the Mansfield side, breathtaking views down the valley floor. This is Ned Kelly country, a kind of Australian version of Robin Hood. Vines and vineyards are high up on hill terraces, the lowest at Milawa at about 155 and the highest at the Whitlands plateau at about 800. The cool climate allows the production of high quality grapes. The deep red clay loan soils are very fertile and well drained. In recent years a plethora of new/innovative and less usual varieties has been planted in the area such as Saperavi (from Georgia), Arneis (or Barolo Bianco from Piemont, Italy), Tannat, Petit Manseng ( a grape variety from the Pyrenees, France, producing aromatic, sweet wines), Mondeuse, Graciano, Marzemino, Dolcetto, Sangiovese and Tempranillo. For more information please visit the excellent and very informative website of the King Valley Vignerons association (www.kvv.com.au) to learn more about this treasure trove of Victorian wines. One finds boutique vineyards (such as Avalon Vineyards) next to the big corporates (such as Brown Brothers in Milawa). Other well known producers are: Pizzini Wines in Whitfield, Dal Zotto Estate is Cheshunt and of course Sam Miranda in Oxley Flats to name just a few. There are a lot of Italian names on the list of King Valley wine producers. Miranda’s Cabernet Sauvignon and Petit Verdot are produced in Oxley on the floor of the valley. The labels on the wine bottles on the Miranda website (www.sammiranda.com.au) are different from the bottle I bought in Jakarta. I suppose that the “High Country” wine became ‘High Plains” wines, but I am not sure because the production dates do not suggest that this assumption is correct. Miranda’s “Snow Road” label wines (low price end of A$ 12.-/bottle) show some “bizarre” blends (blends I would never consider to buy) such as ‘Chardonnay Sauvignon Blanc’, or ‘Merlot Pinot Noir’. Rare varietal wines are presented under the “Symphonia” label.The flagship of the collection is certainly the “Sam Miranda” range of handcrafted wines exclusively sold at the cellar door. Apropos cellar door. On a travel website I found under the heading, “Australia’s most unusual wineries”, a further hint why it might be worthwhile to visit the Sam Miranda Winery (http://travelaustralia.ninemsn.com.au/article.aspx?id=446482). Well, if possible I will get some more of Miranda’s wines from my local bottle shop and next time we are in Glenburn, we might decide to go on a day trip to the King Valley and check out some of the wineries there. This entry was posted on Saturday, April 19th, 2008 at 1:37 pm and is filed under Uncategorized. You can follow any responses to this entry through the RSS 2.0 feed. You can leave a response, or trackback from your own site.